The Tether Table Aero Traveler (Brushed Silver) designed for the photographer on the go. Whether hiking into a location with a backpack or backed into a corner for a tight architectural shot, the Aero Traveler's 16"x14" (40cm x 35cm) platform footprint can go and be used just about anywhere. Ideal for small footprint laptops and Ultrabooks, the Traveler integrates with the complete line of accessories including the heat dispersing, non-slip ProPad and XDC and XDC Duo external drive compartments. 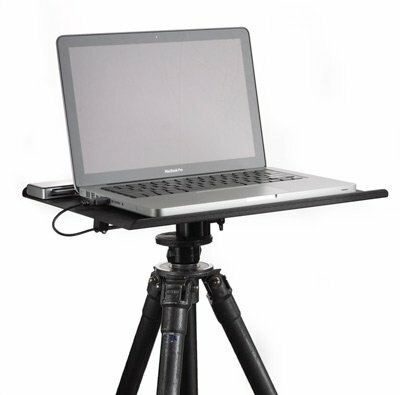 The Tether Table Aero Traveler was conceived by professional photographers and designed by aerospace engineers to meet the needs of photographers seeking a portable workstation. Made completely of T6 Aerospace aluminum, the textured platform is sleek in design and unsurpassed in stability & durability. The Aero Series features the LAJO-4 ProBracket. State of the art design and efficiency for integrated mounting on any 1/4″-20 tripod head, 3/8″ tripod mount, 5/8″ stud studio stand or Arca style mounting attachment. Mounts to any stand, tripod, Master Clamp or Master Arm in seconds, no adapters needed. Includes a custom, high quality storage case to protect your table when not in use. The Aero Traveler is available in 2 stunning finishes, brushed silver or non-reflective black. Made in the U.S.A. and comes with the Tether Tools Lifetime Warranty.